Before we launched Nepalorama Trekking, our founder Krishna guided clients for many years as an independent trekking guide in Nepal. In fact that’s how Krishna and Anna met back in 2012! These are just a selection of reviews and thank you cards that Krishna’s received from his very satisfied clients over the years. So, whilst we’re a fairly young company, our experience goes way back! You’re truly guaranteed the most amazing adventure in Nepal with us! 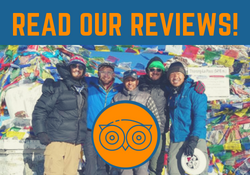 To read our latest client reviews for Nepalorama Trekking, visit Trip Advisor! When arriving at a hostel they would always first make sure we were comfortable, always giving us food before eating themselves.The trek itself was an epic experience i will never forget, we had the best time together and after 8 days together they really felt as friends to us :-)With Nepalorama you can customize your trek as you want, I would highly recommend this company to everybody! We went to Nepal in May 2017. A large group of 11 members, and almost all of us does not have experience in long trek. We contact Krishna via Facebook and his English is freaking good. The good thing of independent guide is flexibility, we changed some plan to fit Poonhill and ABC in 8 days. We met Krishna at the airport in KTM, and stuck at the airport for 5 hours due to storm. When the flight canceled, Krishna took only few minutes to refund the ticket, and get us a van to Pokhara. We arrived Pokhara that night and still on schedule perfectly. During the trek some of us had diarrhoea, Krishna took care of us very well. Our group started to walk separately, Krishna managed to spread out porters to cover everyone. Krishna porters are like the Avenger, we never see them tired. After the trip we are very satisfied that we will choose Krishna again if we go back to Nepal. I spent the first three weeks of December 2016 trekking the Annapurna Circuit with Krishna. Right from the airport I was happy to have him as my guide on this adventure. He is a friendly, open minded and communicative young man with a broad knowledge about the country and – of course – the mountains. He took care of the permit beforehand so we could start just a few hours after my flight arrived. Breathtaking landscapes, perfect weather an amazing culture paved the way to the Thorung-La pass. We had delicious lunches in small restaurants along the route and slept in cozy guest houses, where Krishna ensured I had the best room available. Talking to other trekkers convinced me that I had the best guide by far. While other guides chose easy ways to walk, comfortable times to wake up and even higher places to sleep (which increases the risk of altitude sickness), Krishna always put my adventure and safety first. We woke up earlier than others, walked harder but by far more scenic routes and enjoyed more spectacular views. Krishna was always very caring about my safety, my health and my comfort on the entire route. I never felt unsafe and could always rely on his opinion and competence. During the trip we became friends and still keep in touch. I would totally recommend this perfect guide to anyone looking for an amazing adventure in the Himalayas. I myself am going to take a different tour with my friend Krishna – hopefully next year. We did the Manaslu Circuit with Krishna in November 2016. Our group consisted of my wife, my sister and two of our friends. We are in our late twenties/early thirties and are all from San Diego, California. We organized our trip through a website specializing in Manaslu Circuit information. Then, through another agency, we ended up with Krishna as our guide. I don’t think we could have ended up with a better guide. He was extremely kind, honest and put up with our constant chatter and questions for him throughout our trip. He was very flexible with our itinerary and when we wanted to, let us do our own thing. Before heading to Nepal I was a little worried about logistics and how everything would work out, if there would be a tour guide waiting, if we’d end up stranded in some Nepalese city and who knows what else. You’ll never have to worry about that with Krishna. It seems like Krishna knows everyone in Nepal. The Porters we used were also excellent. They were from the same village as Krishna in Nepal. My only regret is that we had to part ways with Krishna at the end of our vacation. It’s sad we live so far apart as we still, months later, talk about Krishna in our group and reflect how his constant positivity and demeanor made our Nepal experience that much better. As you can tell, we would highly recommend him. I would like to thank Nepalorma Trekking for having a fantastic holiday time in the Nepal Himalaya. I had such a great time, starting with arriving in Kathmandu with very warm and personal welcome and airport pick-up and after that a nice and comfortable hotel stay in Kathmandu near the office of Nepalorama Trekking. After two days in Kathmandu we went on trekking for the highlight of the journey. Trekking for three weeks in Annapurna region (Panchase, Mardi Himal Basecamp, Annapurna Basecamp, Kopra Danda Ridge, Ghorepani, Pokhara). The trekking and scenery was fantastic and impressive, but the best thing was the nice, polite and very friendly company of our professional guide of Nepalorama Trekking. During the days of trekking we had a very good time in the beautiful nature and I learned a lot more about Nepali culture and habits! Also the trekking experience was fantastic, although there were some rainy moments during this monsoon trekking, most of the time the weather was fair and we arrived before the rain came. In morning times there were beautiful clear mountainviews especially at the magnificent Muldai Viewpoint at the Kopra Danda Trek, which is maybe one of the best viewpoints of Annapurna Region! Because of the lowseason at most of the teahouses we were the only guest, which gives an unique experience. When you are searching for some very beautiful, scenic and quiet trekking in Annapurna area I can hihgly recommend going to Panchase Area, Mardi Himal Basecamp or Kopra Danda. This will be a excellent trekking experience, with the friendly, capable and professional help of Nepalorama Trekking! Krishna was amazing! I went solo, just Krishna and I to Everest Base Camp. He was a delight, accommodating and easy to talk to during the trek. When flights to Lukla was canceled, he got us a cheap helicopter ride. When the plane out of Lukla was delayed for days, and I had to make my flight out of Kathmandu, he was willing to stay back so I wouldn’t have to pay the extra $500! A wonderful man and guide! 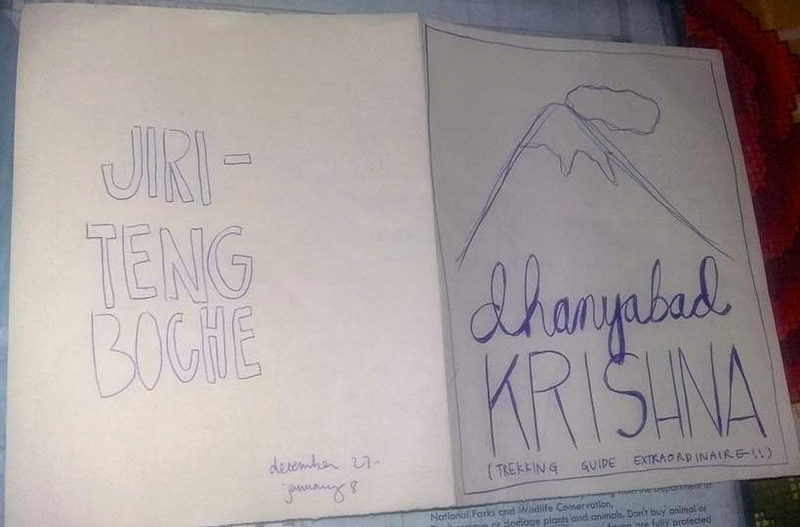 I plan on coming back to Nepal and trekking only with the best – Krishna! It was my first time in Nepal and Krishna was really interesting and instructive. We met him one day before the trek and he was very friendly from the start ! He helped us to buy our bags and other equipments very quickly. During the trek he was listening of our requests and everything was planned before we arrive … trek licence, rooms, restaurants. It was really great. Be sure, Krishna is a very efficient guide for all your treks in Nepal! I did ABC Trek with Krishna. It was just a fantastic and unforgettable experience, especially by the kindness of Krishna. He knew perfectly how to adapt to our rhythm and share his knowledge about everything. I highly recommend him ! See you soon Krishna ! Namaste! we’re from Thailand and this is our first time in Nepal. Our group have plan to trekking to Annapurna Base Camp(ABC) on late April. We’ve Krishna as our trekking guide and this is our best decision ever. Our group is quite large (10 group member) and vary in trekking experience but no matter how many member we have, Krishna can take care us all. Krishna is more than just a trekking guide; He’s friend. Thank you for an amazing and outstanding experience in Nepal. You’re the best KRISHNA!!!!! If you’re looking for professional, friendly, experienced, English well spoken and have a sense of humor. You should called Krishna immediately!! Krishna was a kind guide who was very patient with me and never made me feel bad about my pace! He was always willing to answer questions about Nepalese culture and in fact, offered a great peek into the complexities of Nepali livelihood. Also you’ll always find Krishna smiling which is something to appreciate when you’re struggling to muster one up yourself! 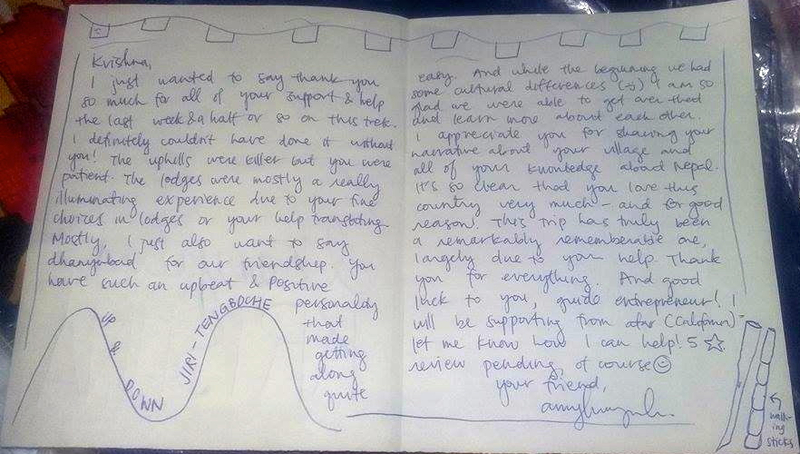 Amy also gave Krishna this homemade card! Krishna is a wonderful guide and a lot of fun to spend time with. He knows all the locals, he knows the culture and he loves trekking. I spent 3 days with him and enjoyed myself thoroughly. He pushed me to climb – it could be really exhausting! But he was also patient with me when I had to take a break or just wanted to enjoy the beautiful scenery. I especially loved how he would play Nepali music off his phone, for entertainment. I also noticed that he has strong relationships with many of the locals in the villages we passed through – this is really important. I’d highly recommend Krishna and look forward to my next adventure with him in this beautiful part of the planet. When you head into an area you’ve never been, to attempt an activity you have never attempted before, you can feel fear and a little bit of uncertainty about your ability. Krishna serves you well as a guide, taking care of all of these psychological elements, but also informing you about the country, the culture, and the skills you need to develop to do high altitude trekking. I have never had a more exciting adventure in my life. From the fertile Miyasinghde River Valley to the high peaks near Annapurna 2 and Dhaulagiri, I absorbed every detail and exciting moment of our trek. And having Krishna there at 4.30 in the morning at 5200 meters, on our way up the pitch black side of the mountains, to a place I had never been before, was probably the most reassuring and powerful moment of the journey. Looking back, I will always remember crossing over the last hill and turning the last corner to see the Thurong La Pass, the world’s highest, right in front of us. I couldn’t breathe very well. It was very cold. Icicles hung off of my beard. But we kept walking and got there. We stood in front of the prayer flags and took pictures. And now I have evidence that new things bring great changes. Thank you to Krishna for making me a “Master Trekker” and guiding me 140 kilometers through the most intensely beautiful country in the world. Krishna is exactly what we were looking for in a guide. My three friends and I were doing a small world tour and wanted to setup a guide in advance of our month long stay in Nepal. We found Krishna’s contact information and from the start he was incredibly knowledgeable, prompt, and courteous. My friends and I are safety nuts and we felt very at ease with Krishna’s ability to answer all our questions and demonstrate his many years of trekking experience. Everything went smoothly from first contact, to the initial meeting, to saying goodbye in Pokhara. Krishna had a great plan, was flexible and responsive to our needs, and had great local contacts to make sure we always had an excellent accommodation (even when a snow storm rolled in and Manang was packed!). I can’t recommend Krishna enough! Krishna Adhikari was an excellent trekking guide for me and my three friends during our 19 days on the Annapurna Circuit trek in October/November 2015. Above all, I’m grateful he made sure we were safe and comfortable while showing us the striking, unparalleled beauty of the Himalaya, its culture, and traditions. Better yet, he did so all at a very reasonable price, even considering we’re budget travelers. The main advantage of hiring Krishna is that he’s well-versed in the popular Himalaya treks since he’s worked in tourism in the region from the time he was a teenager! Krishna arranges all the complexities of your transport, lodging, and food as well as planning and adjusting your route based on many factors as they arise. Therefore, you can focus on enjoying the stunning scenery and taking care of your health at high altitude in challenging conditions. Don’t hesitate to trek with Krishna – you won’t regret it! Finally, even though we were concerned about difficulties post-earthquake and mid-fuel-crisis, we’re very glad we went to Nepal and trekked the Annapurna Circuit. We encountered only minor inconveniences, such as higher-priced transport and fewer restaurant menu options, as travelers. Be certain that Nepal is open for tourism! Elliot went on to write a blog about his trek with Krishna in Nepal. I spent three wonderful weeks in Nepal in February 2015. Most of my time was spent trekking in the Langtang area. I used Krishna’s trekking service and everything went very smoothly. My guide was very attentive and made the trek very enjoyable. The mountains, villages and people were amazing. When I decided to make a change to the plans, Krishna worked with me to arrange a few days in Chitwan at a very nice resort. I plan to return some day to do the Everest Base Camp trek and I will use Krishna for certain. I highly recommend his company to anyone wanting a great no worries Nepal experience! Krishna is excellent! In January 2015, Krishna organised an awesome trek to the Annapurna base camp and we all had a great time! Krishna is well organised and was excellent in managing our trek. If you are wanting to trek Nepal look no further than Krishna! We are a group of 4 ladies without any clue about real trekking and no idea about Himalayans. Luckily, we met a nice young lady at the airport and she said that she organized everything with the agency called NEST. After a long discussion, we decided to go on the same route with her group, which was Trekking to Annapurna Base Camp (ABC). We were travel on the same dates. Thank you to our agency who organized everything for us in such short notice. We end up by getting 2 porters and shared guide with the other group (same nationality), which was good enough. Mr. Krishna Adhikari, our guide turned out to be the great guide for us. His priority is customer’s safety. Our group is 9 persons with different walking speed. Krishna managed porters to be with us along the way, so we did not get lost. He also called porters along the way to check up others. He is also gentle and kind with full of knowledge about trekking in Nepal. Amazing view at the Annapurna Base Camp (ABC), and we were so happy because we “walked” to get there. Mountains are enormous and huge. We feel close to nature and love life in mountains. So peaceful and happy (without internet). On the last night of trekking, all trekkers and locals had a little party, sing and dance in Nepalese way. So much fun. This is one of the lifetime’s experience for me. I hope to be back one day for trekking again. 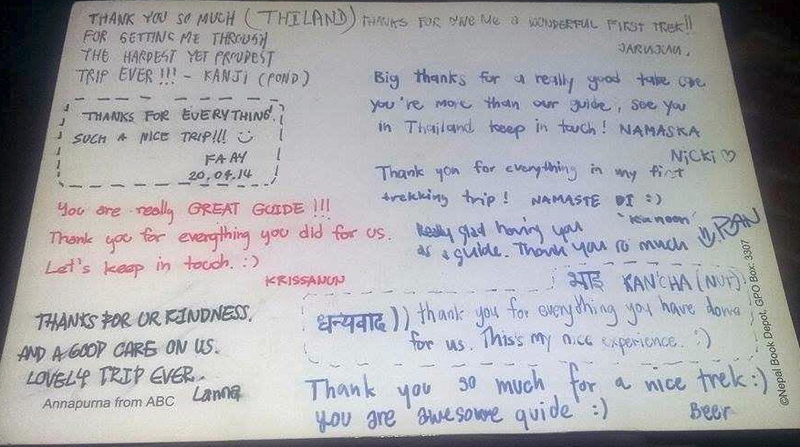 Our little group of my friends and I from Thailand went trekking under the take care of Krishna and other 3 guide assistants in October 2013. Krishna was a professional guide with polite manner and generosity. He took a very good care for everyone of us without any mistake all along the trip and made good decision in every kind of situations that came up. So many many thanks for having him as our guide for our first trekking trip!! It is very hard for me to put in words what an experience it is to do a trek in the himalayas, it just have to be experienced. And maybe even harder to describe what an Amazing person Krishna Adhikari is. In 7 days he became a friend for life. The kind of person you think of and smile. We felt safe, taken care of, guided and loved by Krishna. ThankYouThankYouThankYou and Namaste! I’ve known Krishna for over three years now and he has guided me on three different treks. I was lucky enough to meet Krishna initially through an organised group trek and promptly asked if he would guide me on my first solo trek. Krishna knows all the trekking regions extremely well and made plans along the way – I hate being tied to an itinerary! He takes care of everything both on the trek itself and in the teahouses. Nothing is too much trouble, he’s at your service anytime you need him. Krishna is knowledgeable, trustworthy and fun to be with. For a group or solo trekker, you won’t find a better guide than Krishna. I would highly recommend him to anyone. In March we had wonderful days on the Annapurna – Dhaulagiri Himalayan mountain trek, it was an incredible experience and absolutely amazing! So we would like to thank our fantastic porterguide Krishna Adhikari and recommend him very strongly! Krishna is a very experienced and knowledgeable guide and porter. He speaks very good English and knows a lot about the Himalayas, terrain, cultures and religions. Route-finding, organising food and lodges could not be better. Krishna is a gentle and very friendly young man who seems to have friends everywhere! He also has a great sense of humour and we know from talking to him that he is just as familiar with the Everest region as the Annapurna. We feel very lucky that we had Krishna as our porter-guide and would love to have him again as our guide (and porter) in the future! In February 2013 i visited Nepal for 21 days, 10 of them i spend on the Annapurna Sanctuary Trek. The Sanctuary Trek is 120km (+/-) of perfect landscape, and when you visit it in Mid February the trek is not so busy and you got the perfect climate. Even so you have a nice and clear view on all the mountains who surrounding you. It was my first time in Nepal on a trek and so i decided to have guide, a friend of mine recommends me a excursion company called Karnali Excursions, there are hundreds maybe thousands of trekking company’s in Kathmandu, now i can say, this is one with excellent guides! Over Karnali i get to know Krishna, my professional guide for the next 10 days, he managed everything for me, the bus from Kathmandu to Pokhara and return, accommodation before/on/after the trek and for sure guiding, he provides you with good information on the trek and makes sure that you stay on your trek, you can speak english with him and after a week you are friends! 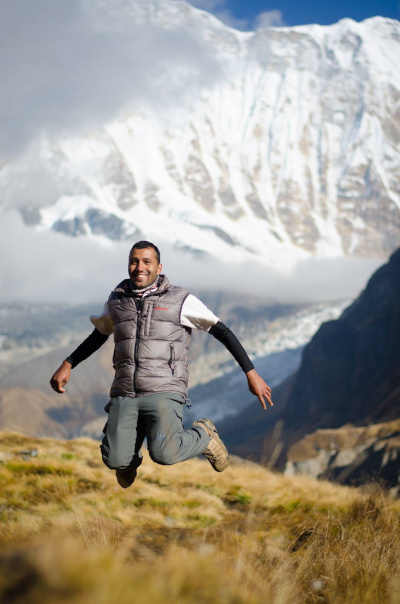 I met Krishna in 2012, He was a guide for a group of 12 people through the Annapurna range. Over the 8 days he provided in depth knowledge of the history of Nepal and the region, the mountains flora and fauna and the beautiful culture of Nepal. His patience and humor are notable traits as well as compassion and empathy. The trip was a magical experience that I treasure and constantly look back on with fond memories. There was lots of laughs, a couple of tears, sore feet from walking and sore mouths from smiling and lots of great views. I can’t wait to come back to Nepal to see him again. Much love. Krishna is an awesome trekking guide and from the beginning to the end of our five day trekking experience he was effortlessly courteous and helpful with a winning smile and cheerful humour. Krishna is an amazing guide, he is one of the kindest person I met. I trust in him deeply! He knows his job and take care of everything ! I learnt a lot with him and I hope to go trek again! Such an amazing expérience! Thank you to Parat Mahuttano who took the main photo image of Krishna with his group.